Background Checks Bill Gains Backers On And Off Capitol Hill : It's All Politics The Senate is set to take up legislation that would expand gun buyer background checks on the heels of an endorsement from an important gun rights group, and steady pressure from Sandy Hook families. 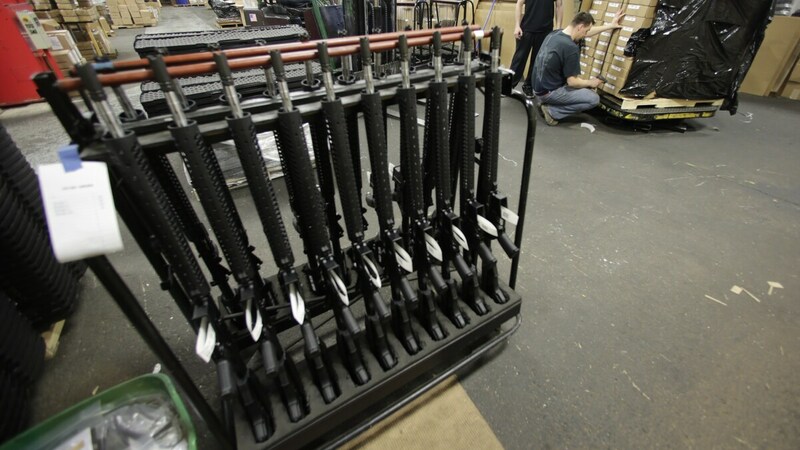 Newly made AR-15 rifles at Stag Arms in New Britain, Conn., last Wednesday. The Senate was due on Tuesday to take up legislation embodying the bipartisan compromise reached by two senators, West Virginia Democrat Joe Manchin and Pennsylvania Republican Pat Toomey. The effort to extend background checks to weapons purchases at gun shows and online received a boost over the weekend when an important gun rights group, the Citizens Committee for the Right to Keep and Bear Arms, announced its support for the measure. Robert Spitzer, one of the nation's top experts on the politics of gun control and a political science professor at SUNY Cortland, called it a "significant" endorsement. "The [group] has been around since the 1970s, and I do not recall them ever endorsing any real gun control measure," said Spitzer, author of The Politics of Gun Control, in an email response to questions. The Citizens Committee claims to be the nation's second-largest gun rights group. Spitzer also noted support for the expanded background checks from the lobbying group Independent Firearm Owners Association. "Add to this the dogged personal lobbying of family of Sandy Hook victims, and the weight of the Bloomberg and Gabby Giffords group, and that suggests some real momentum that may even carry this thing through the [Republican-controlled] House." Spitzer said the Citizens Committee "has credibility with the gun rights community, which makes its endorsement more significant beyond its membership numbers. It compiles a lot of research and writing, and [is] a go-to site for the gun rights people." The National Rifle Association, the nation's largest gun rights group, opposes the measure. In the House on Monday, Republican Peter King of New York and Democrat Mike Thompson of California introduced a companion bill to the Senate measure. Despite a sense of momentum, the fate of the legislation is far from certain, even in the Democratic-controlled Senate. Majority Leader Harry Reid, the Nevada Democrat, acknowledged that Monday: "I hope there aren't going to be a few unreasonable extremists who are going to try to prevent an up or down vote on the legislation," Reid said on the Senate floor.